Soviet T-34: Best Tank Of WWII? The Russian T-34 Medium Tank and its variants were certainly the most produced tanks during the Second World War, but the debate still remains over whether it was the most effective. It was easy to maintain, fast and heavily-armoured, and severely shocked the Germans when it first arrived on the front line. Russia’s research into a new Medium Tank began in 1930s; the main designer of the T-34 – Mikhail Koshkin – mentions that he first considered the plans in 1934, hence the model number, “T-34”. However, it was only from 1937 onwards that Russia actively searched for a new tank to replaced its previous BT-7 cavalry tank, which had performed terribly in the recent war with Japan. The tank arsenals of the Soviet Union were still constituted by many lightly-armoured and small tanks, designed for speed and agility. These were great for manoeuvring battles but their fighting disadvantages proved deadly at the commence of Russia’s war with Germany. On the 22nd of June 1941, Germany launched their invasion with an enormous artillery barrage. Support Medieval! Podcast on Patreon and gain access to bonus episodes, sneak-peeks and many more rewards! A design was drawn from the A-32 in 1938 and the first prototypes was built in 1940. In January, two models rolled out of the development facilities and took on a painful test ride from Ukraine to the spirit city, Moscow, then to the edge of Finland and Kiev. They then returned to their hometown, Kharkov. In order to increase production speed and overpower the adversity using sheer numbers, development cost would have to be kept low and the goals very simple so that even unskilled labourers could work on the tanks. This allowed them to produce vehicles at high speeds and in ridiculous quantities. There were limited machine tools so design had to be simple. Manufacturing of the T-34 was often crude as it was not a sophisticated design and the production was almost rushed. Huge numbers of tanks were extremely important to the battle on the Eastern Front. Yet army officials still wanted a mighty tank with the ideal three features – a powerful gun, strong and thick armour and high speed and mobility. Previous tanks had been extremely vulnerable to anti-tank guns and explosives; the Soviets wanted a heavily-armoured tank that would still be quick. Production of the T-34 began in September 1940. The Model 1940 T-34 used a V-2-34 V12 gasoline engine, which was taken from BT series tanks and was the first diesel engine specifically designed for the purpose of powering armoured vehicles. It outputted five-hundred horsepower and allowed cruise speeds of up to 35mph. 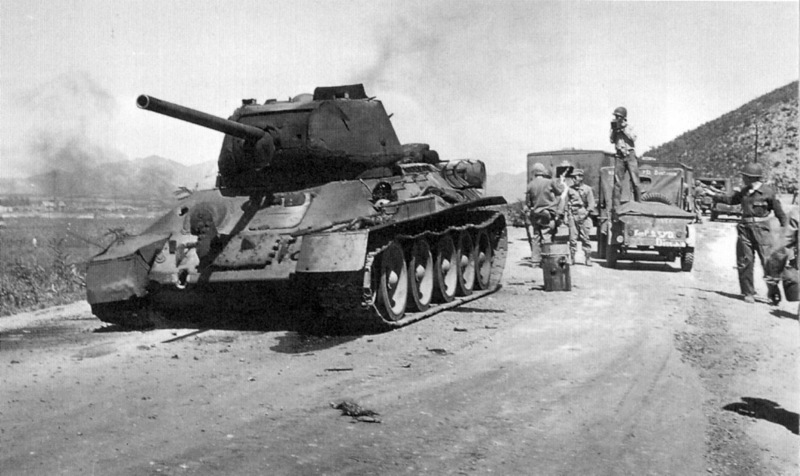 The agility of the T-34 also derived from the BT-17. A Christie suspension system allowed for very high speed, about 10mph faster than the German Panzer III and IV. The T-34 had huge tracks and could tackle both mud and snow with ease. Fifty-millimetre armour sloped at a 60 degree angle on the front of the tank made the tank almost invincible to frontal attacks. Projectiles heading straight on towards the T-34 would most likely deflect off it. This meant that German anti-tank 50mm Pak 38 guns and the 50mm guns fitted to Panzer IIIs were almost completely unable to destroy it. Armed with an L-11 76.2mm gun, the T-34 was the ultimate surprise for German soldiers in 1941. They had believed that defeating Russia would be easy, following their victories over Poland and France earlier in the war. Not many of these tanks were in service but they were still spotted and feared by the Germans in their initial appearances, in very small numbers or groups. As production speeds rapidly increase throughout the year, they were sighted in much large units. On the 22nd of June, 1,066 were prepared for the battlefield. By July 1941, hundreds more were ready for service. In total, the USSR had an arsenal of over twenty-thousand tanks, several times as many as the Germans. However, gunners still found it difficult to penetrate enemy tank amour in many circumstances with the 76.2mm gun and early battles in front of Moscow showed the designers that many improvements needed to be made to the T-34. The 1941 Model was fitted with an F-34 76mm gun which was more powerful and had a higher projectile speed of about 2,130 feet per second. In addition, it had even heavier frontal armour and a welded or cast turret. As well as the main gun, the T-34 wielded two 7.62mm machine guns. Although the turret and gearbox were upgraded numerous times throughout the Second World War, they still had their problems. As a two-man, manually-traversable turret, it was slow moving and tiring to aim. The commander often had to act as a gunner as a result of this. Furthermore, the turret lacked a basket, meaning that equipment and empty shells would roll about the interior and become tripping hazards for the crew. The gearbox and engine were unreliable and often got stuck; the commander often had to smash the transmission with a sledgehammer to get it to work again. T-34s didn’t have radios, so they waved flags at each other to communicate. Due to the sloped armour, there was not much space inside the T-34 and it became very cramped. Visibility was also awful; commanders often had to open the hatch just to look out and guide the tank. Periscopes were later added for improved visibility. Early the next year, the 1942 Model went into production. There were several changes to improve speed and it now also had two hatches in the turret. Therefore, the Germans called this model the “Micky Mouse”. New, broader tracks were added for better control and ruggedness. Soviet production lines quickly ran out of rubber for the tracks and T-34 tanks were often fitted with metal wheels, which made nasty vibrations and jarring sounds when the T-34 was cruising at high speed. This made it difficult for the tank crew to concentrate and stay sane. Many Soviets had been killed, lost or captured by the Wehrmacht during the Germans’ initial advance of Operation Barbarossa, so there weren’t as many soldiers to man the tanks. Small crew sizes were often a problem, even though there was a staggering number of tanks inthe Russian arsenal. T-34 production was at just over a thousand tanks per month. Heavy rounds fired at the front of the T-34 by powerful German guns – which were developed during the later stages of the war – could cause sharp metal splinters to fire off inside the tank. Fuel cells could be tragically burst within the interior when they were struck from the outside. The last model came out in 1944, with an 85mm gun and some major design changes, practically making it a completely different tank. 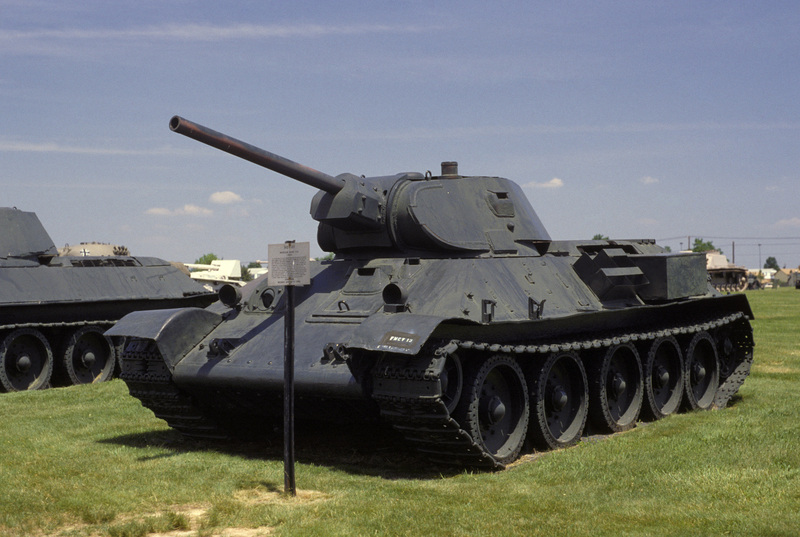 The T-34 was the most commonly produced and used tank of Russia during WWII, and was used in active service until 1958, with approximately 84,000 constructed. It has been one of the longest serving tanks ever, and extremely crucial to forces all around the globe following the war and through the eighties and nineties.